Let me begin by saying that I don't claim to be some kind of trained music expert. I don't understand all the technical nuances that go into stringing together a collective of sounds to produce a harmony. But, what I do know is that I am drawn to music that captivates me into all kinds of feels because music is the underlining and show-stopping pulse of life. And when I hear a sound that drives me to dance like nobody's watching, I can feel my energetic frequency leveling up in ways that is otherworldly. That's what the hypnotic sounds of New Thousand did to me. Sent me into a sort of bewitched frenzy, much like the fabled tale of The Red Shoes. You know the story, right? The one where the peasant girl becomes enamored with a brand new pair of red shoes her adoptive mother purchases for her. They are the ideal shoes for dancing anyone would covet, and she wears them repeatedly in the house of God, regardless of being scolded for her shameless vanity. Eventually the shoes take over, causing the girl to dance non-stop; through thickets of thorns that tear at her limbs; as her feet bleed the same crimson red of the shoes. Even after the girl has her feet chopped off in desperation, the shoes go right on dancing with her amputated feet still snug inside their vessel. But, I digress. New Thousand's music is like those red shoes—but in my tale, I welcome the bleeding that is so essential to being alive. You can't exactly pinpoint their sound to one, or even two categorical checkboxes. Their instruments come together in a way that is both fresh and familiar, and collectively, they produce a symphony of sound that is funky, metal, classical—and guaranteed to seduce you (unless you are sorely lacking a pulse). Adrian Jusdanis is a violin virtuoso. Jusdanis smacks, blows, strums and glides his bow across violin strings to produce an eclectic range of sound in a single set. Sounds produced are reminiscent of record scratching, electric guitar, Axl Rose-ish/western showdown whistling, and classical concerto. Jusandis is like the Pied Piper and I follow like the children of Hamelin, except I am willingly lured away by the magic of his violin! Max Jones is a synthesizer on keys. Jones shocks you with an electric charge through a combination of tone and voltage. Like a conductor who unifies and shapes tempo and beats, Jones' keyboard queues when its time for a new episode and guides the transition to a new leg of their set. I ran into Jones on a couple occasions, pedaling his equipment to their next curbside destination. We exchanged waves and he flashed me his brilliant, dimple-ridden smile. Like a John Hughes moment. Alex Koltun is a sort of backbone running through the band's musical body, and he nods to the beat of his own drum by way of an electronic percussion. Koltun's steady trap beats take me back to the old school, getting blunted and rolling around in my friend's ride who happened to be one of Seattle's well-known club promoters back in the day—trap and trip hop blowing out his car speakers. Koltun gets me feeling high on life. Additionally, it appears that they have a revolving door of guest drummers. I have to say that when they add a live drummer to the mix, it gives yet another layer of edge, pushing their sound to further levels of high-octane. Through my online sleuthing, I've read that the three have known each other since they were knee-high. The trio oozes with collaborative chemistry, which is an obvious result of their history together. Part of me wishes someone would produce these guys and bring them to the masses, however, what makes New Thousand so special is that they bring the masses to their street performances, drawing in crowds by ear as one might follow one's nose towards the delicious. They also get to call all their own shots and keep all the money they deservingly earn (don't shut up BUT take my money!). Besides making me turn into a dancing queen, I also gained creative inspiration from watching and listening to New Thousand perform. Whenever I think about a scene I am writing, I always have a certain soundtrack in mind to accompany the cinematic storytelling. I was instantly transported by their filmic sound in how it could pair harmoniously with the darkly dramatic scenes I have brewing. 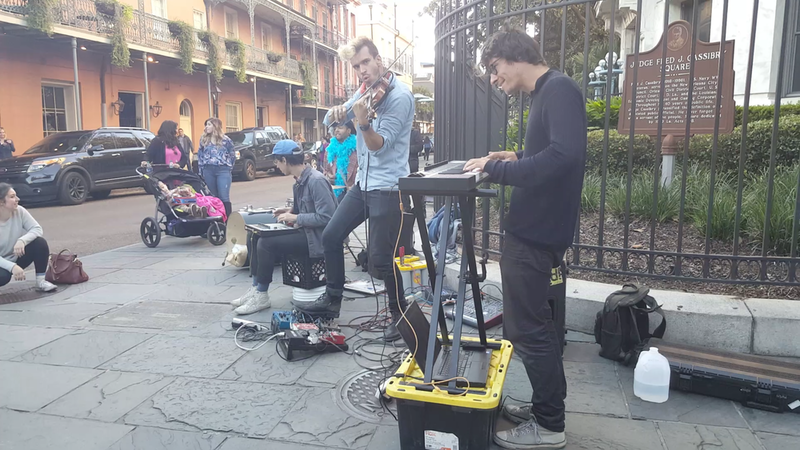 Street performance is not for the weak of heart (or in Jusdanis' case, arms), and I would argue that the vibrant and pulsating streets of New Orleans is an equally valuable member of their band. You can't just listen to a band like this. You have to bear witness by being present, experiencing the snake-charming effect firsthand in an equally enchanting city. I leave you with an assortment of video uploads to entice you, including the trailer to their documentary, Down & Dirty. I'm incredibly thankful to all those that recorded and uploaded New Thousand performances because I was too busy swaying and dancing (obvious from the shaking in the above two short clips that I managed to capture). I am already planning for another trip to NOLA next year, and I hope my lucky stars guide me to more New Thousand performances. They've absolutely made a groupie out of me!